Paul Gauguin (1848–1903), Winter at Pont-Aven, petit Breton et ramasseuse, or petit berger breton (1888), oil on canvas, 89.3 × 116.6 cm, National Museum of Western Art 国立西洋美術館 (Kokuritsu seiyō bijutsukan), Tokyo, Japan. Wikimedia Commons. 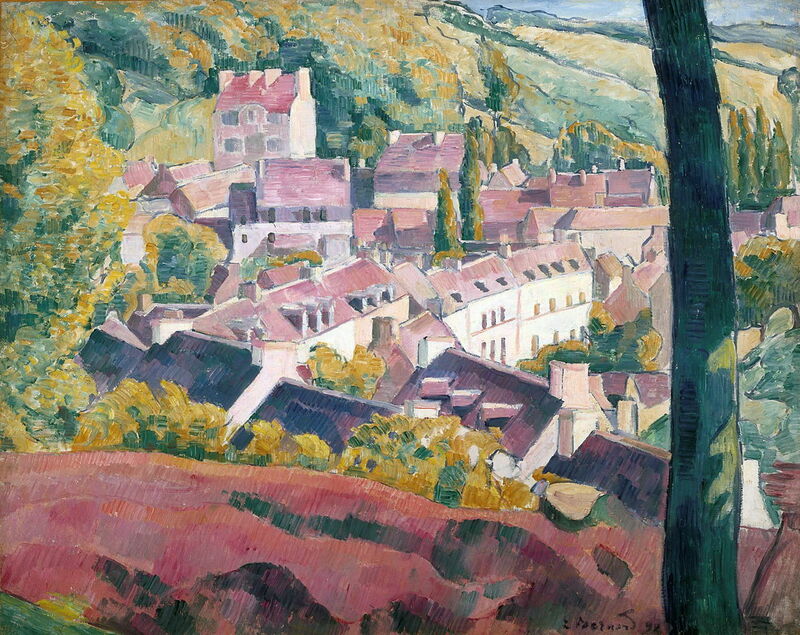 By 1886, the village of Pont-Aven in Brittany was the centre of a vibrant international artists’ colony, which attracted painters from all over Europe and North America. Although many of them became well-known in their day, few were destined to be ranked among the most important painters of the century. 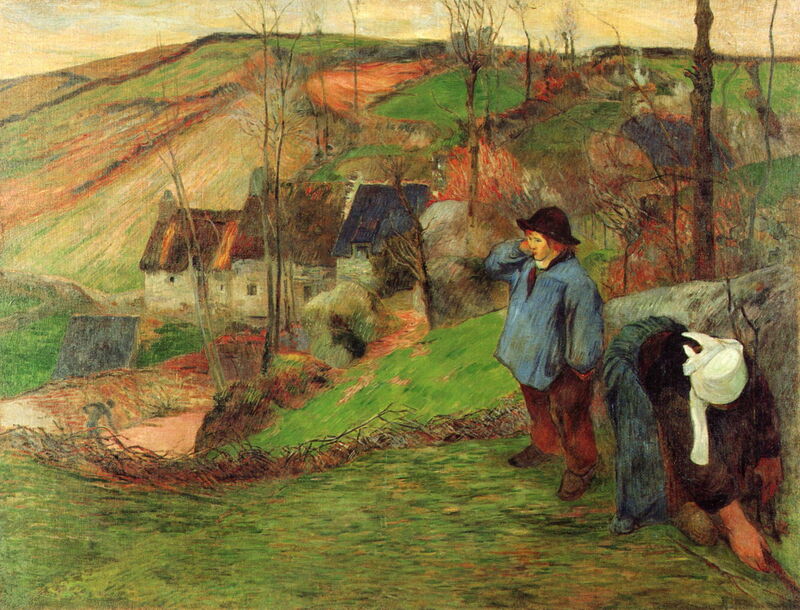 That changed in 1886, when Paul Gauguin first visited the village. Gauguin had been a stockbroker by trade and an amateur artist until the Paris markets crashed in 1882, which drove him to try to earn his living from his art. He had spent time with his wife and five children in Copenhagen, returning to Paris in 1885. To make ends meet during the winter of 1885-86, he had worked in various menial jobs, and was struggling to paint much. He exhibited at the eighth and final Impressionist Exhibition in Paris in May 1886, then spent the summer in Pont-Aven, where he could live more cheaply than in the capital. He got on well there, both with the other artists and in his art. He made some pastel drawings of figures, and landscape paintings. Among Gauguin’s new friends there was Charles Laval, who accompanied him in a visit to Panama and Martinique the following year. Later in the summer of 1886, Émile Bernard arrived for his first visit to Pont-Aven, and met Gauguin. In all, Gauguin visited the colony in 1886, 1888, 1889-90, and finally in 1894. Bernard visited in 1886, 1888, and 1891-93. Paul Gauguin (1848–1903), Lollichon Field and Pont-Aven Church (1886), oil on canvas, 71.3 × 92 cm, Private collection. Wikimedia Commons. Lollichon Field and Pont-Aven Church was one of the landscapes which Gauguin painted during his first summer at Pont-Aven, in 1886. Paul Gauguin (1848–1903), Cove opposite Pont-Aven Harbour (1888), oil on canvas, 73 × 92 cm, Private collection. Wikimedia Commons. Cove opposite Pont-Aven Harbour (1888). 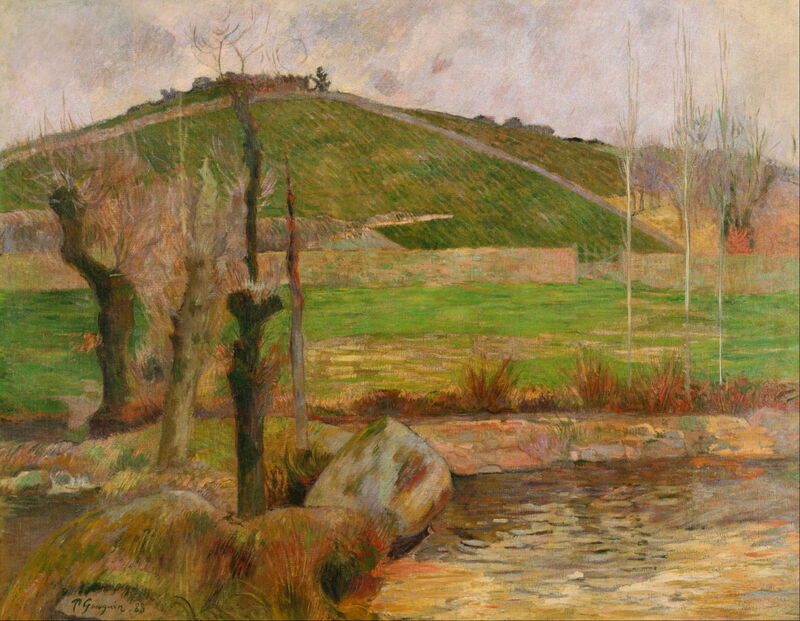 Paul Gauguin (1848–1903), L’Aven en contre bas de la Montagne Sainte-Marguerite (Landscape near Pont-Aven) (1888), oil on canvas, 72.9 x 92.2 cm, Bridgestone Museum of Art ブリヂストン美術館, Ishibashi Foundation, Tokyo, Japan. Wikimedia Commons. L’Aven en contre bas de la Montagne Sainte-Marguerite (Landscape near Pont-Aven) (1888) shows the River Aven at the foot of Saint Margaret’s Hill, just outside Pont-Aven. Paul Gauguin (1848–1903), Path Down to the Aven, Pont-Aven (1888), oil on canvas, 92 × 73 cm, Ordrupgaard, Jægersborg Dyrehave, Denmark. Wikimedia Commons. Path Down to the Aven, Pont-Aven (1888). 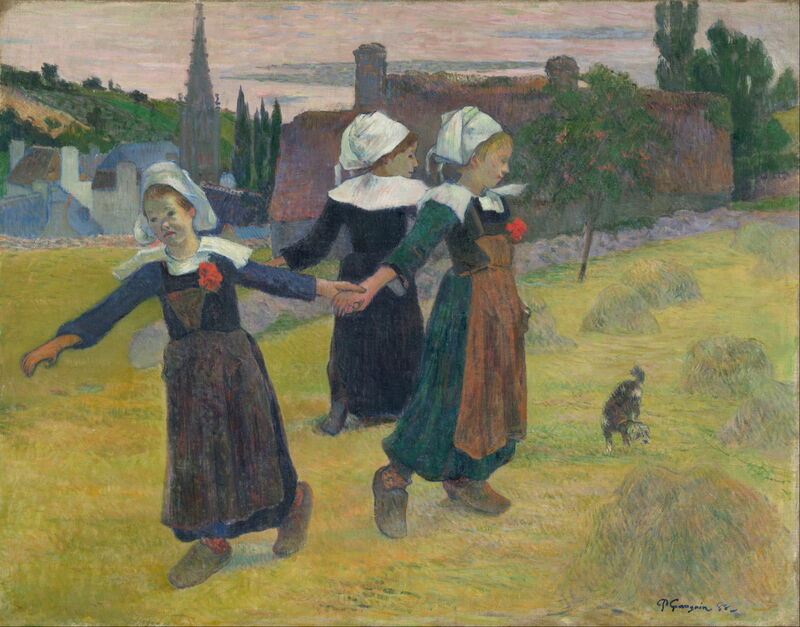 Paul Gauguin (1848–1903), Breton Girls Dancing, Pont-Aven (1888), oil on canvas, 73 × 92.7 cm, National Gallery of Art, Washington, DC. Wikimedia Commons. Breton Girls Dancing, Pont-Aven (1888) is one of Gauguin’s most famous paintings from Pont-Aven, and includes a wonderfully scruffy little dog. Winter at Pont-Aven, petit Breton et ramasseuse, or petit berger breton (1888) includes an old Breton woman bent almost double as she collects firewood. Bernard’s initial training had been in decorative arts, but in 1884 he started at the Atelier Cormon, where he made friends with Henri de Toulouse-Lautrec and started to experiment in style. He then progressed to the École des Beaux-Arts, but was suspended from there, so he set off to tour Brittany on foot. 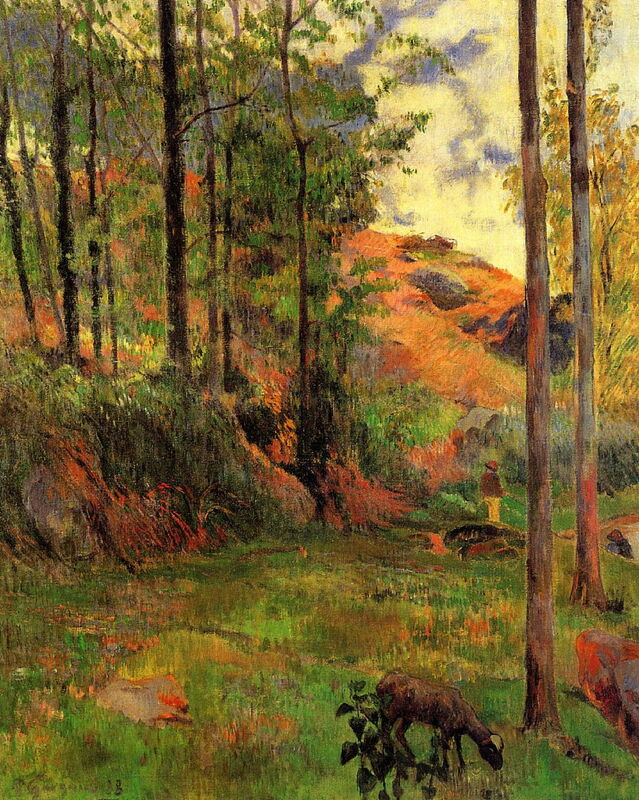 In August 1886, the eighteen year-old Bernard arrived in Pont-Aven, where he met Paul Gauguin. The following year, Bernard was back in Paris at the Académie Julian, where he met Vincent van Gogh. 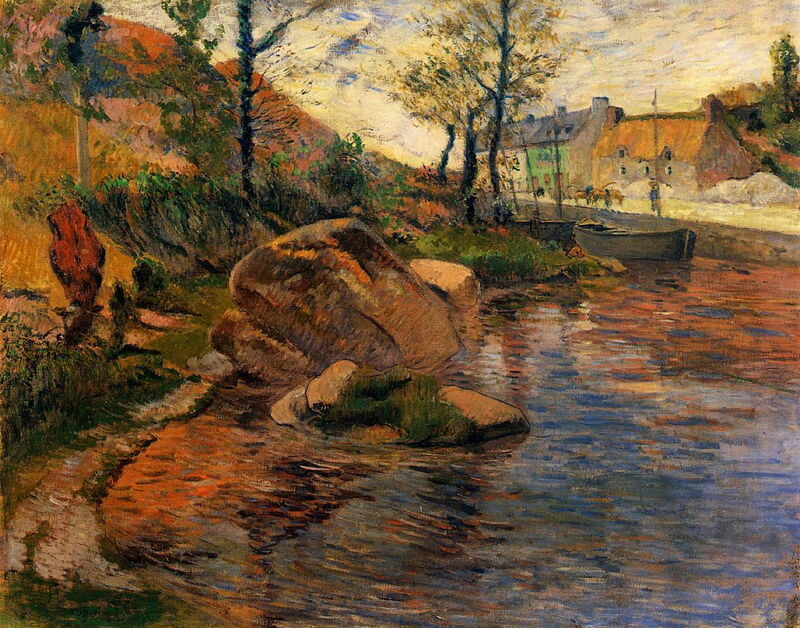 In the summer of 1888, Bernard walked back to Brittany, to meet Gauguin again in Pont-Aven. They became close friends, and discussed their art; Bernard was already pursuing theories about his art, and his aims, and apparently impressed Gauguin. At this time, Bernard collaborated with both Gauguin and van Gogh. 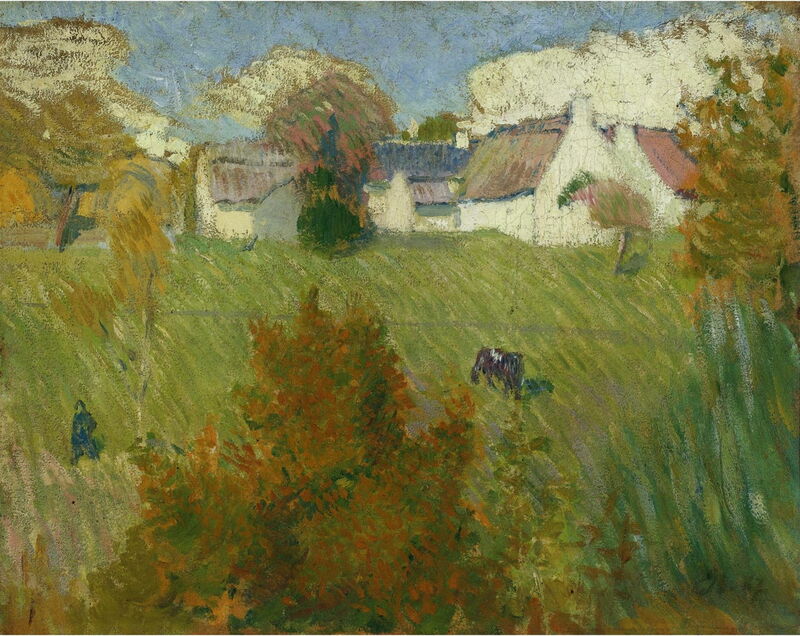 Émile Bernard (1868–1941), Farm at Pont-Aven (1887), oil on canvas, 33 × 41.3 cm, location not known. Wikimedia Commons. 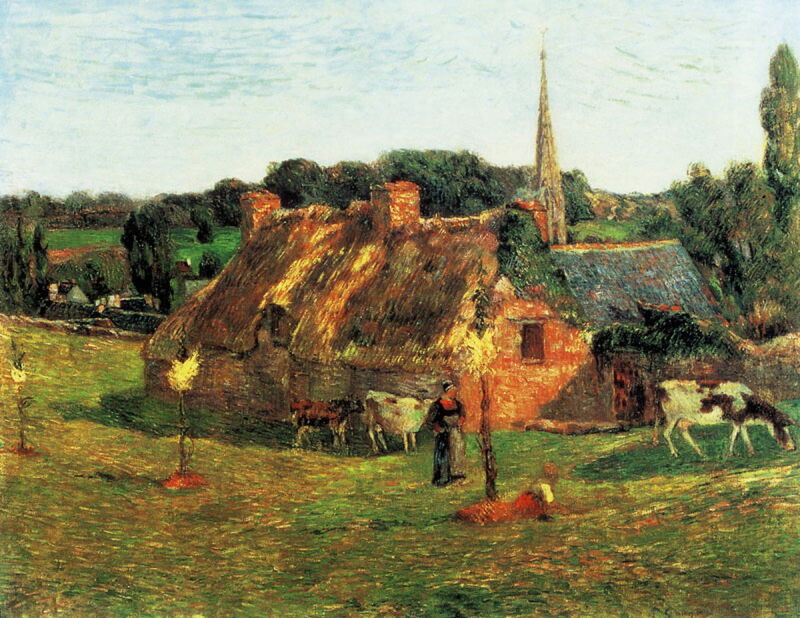 Farm at Pont-Aven (1887) shows Bernard’s highly structured brushstrokes, which are usually compared with Cézanne’s ‘constructive stroke’. If this is dated accurately, this work was painted after Bernard had left Pont-Aven. 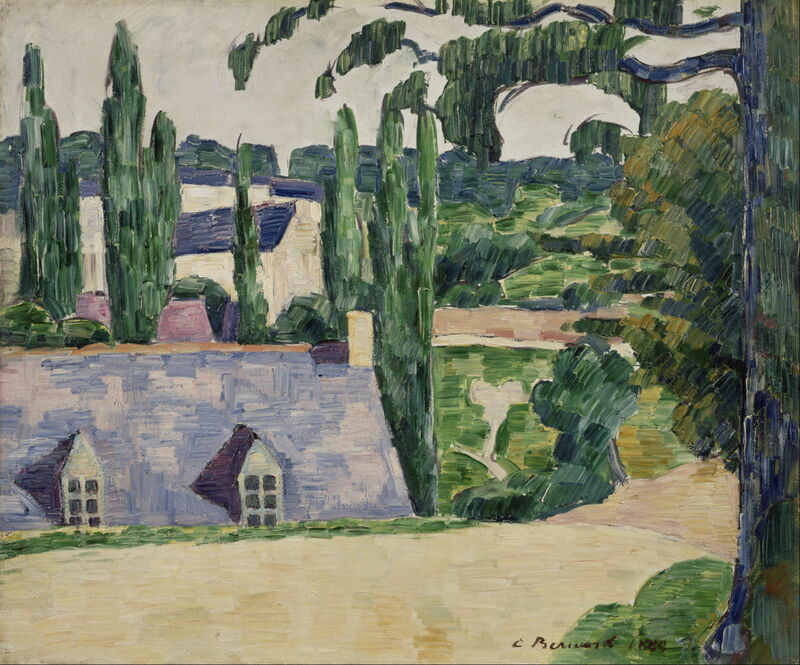 Émile Bernard (1868–1941), House among trees: Pont-Aven (1888), media and dimensions not known, Van Gogh Museum, Amsterdam, The Netherlands. Wikimedia Commons. 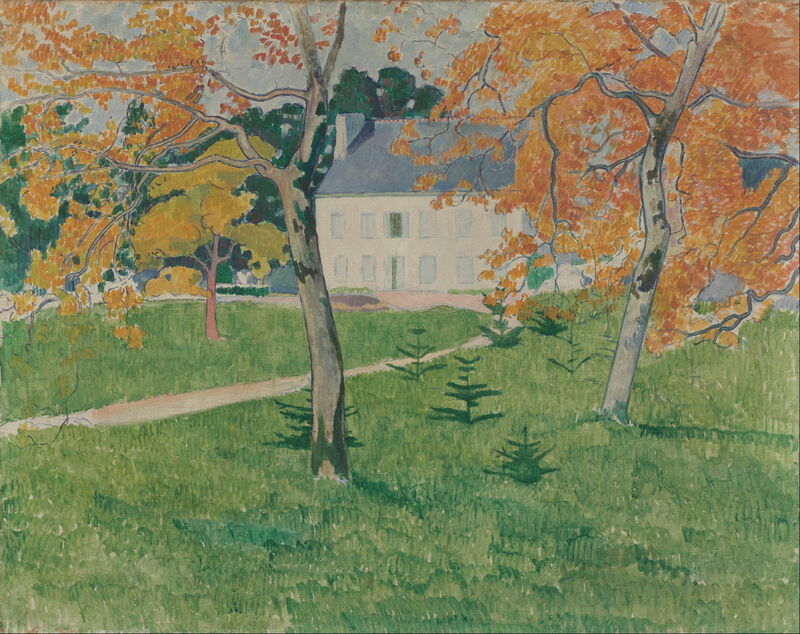 House among trees: Pont-Aven (1888). Émile Bernard (1868–1941), Landscape at Pont-Aven (1889), media and dimensions not known, Van Gogh Museum, Amsterdam, The Netherlands. Wikimedia Commons. In Bernard’s Landscape at Pont-Aven (1889) the similarity of his brushstrokes with those of Cézanne’s late oil paintings is very clear. Émile Bernard (1868–1941), Pont-Aven Seen from the Bois d’Amour (1892), oil on canvas, 72.1 x 92.1 cm, Indianapolis Museum of Art, Indianapolis, IN. Wikimedia Commons. Pont-Aven Seen from the Bois d’Amour (1892) was painted from the edge of the wood which is shown in Marie Luplau’s Le Bois d’Amour, in the previous article. This small selection of the paintings made by Gauguin and Bernard makes clear, I hope, how different their work was from the paintings in the previous article. Although they painted in the same physical location, their art was quite different, and distinctly post-Impressionist. In the next and final article, I will look at the work of Charles Laval and others who painted in Pont-Aven from 1886 into the twentieth century. Posted in General, Life, Painting and tagged Bernard, Gauguin, landscape, painting, Pont-Aven, van Gogh. Bookmark the permalink.